I'm pretty grateful that a year has gone by. Last year at this time we were in the throes of a wedding. A wedding in which yours truly was the MOTHER OF THE BRIDE. To say that I'm now breathing a sigh of relief is an understatement. This weekend feels like a BREEZE. This makes me think of how we need to ALWAYS feel THANKFUL... and relieved (when we're thankful and relieved). That's us with them, a while back. Anyway, today feels kind of relaxed ... COMPARED. Those are her great grandson and her great granddaughter. I think they could be related!!!!! On a different note: Hubby and I are going to the BEACH in Florida this next week. We are beyond excited. Yes, lots to celebrate in a year's passage of time. They still look like newlyweds...how wonderful to be so full of hope and happiness. I too, feel a great deal of thankfulness and RELIEF for this year and TODAY, considering where I was a year ago at this time. You are so right....it is so important to allow and acknowledge those feelings....it seems to make life much sweeter. The resemblances between those three are amazing! What's even more amazing is that you have a color picture of your mom. Have a blast in Florida...its so pretty on the beach. And...RELAX!! Looking forward to those pictures and hearing about your adventures. I know, Audrey. 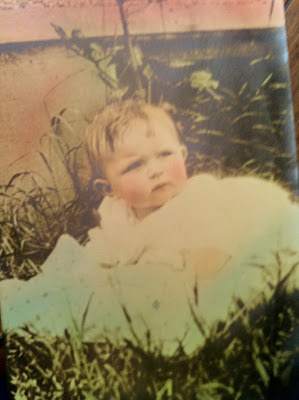 Isn't it wonderful that we have that picture of Mother as a baby? - And it's in color! After I hit 'publish' to this post I thought I probably should have had that picture on a different post - that just honored Mother. Oh, I think it is great where you have it...AND can be in its own another time. But, look at your mom's expression, how pensive she was...I think she was already figuring everything out...like she was organizing the family tree, and figuring what she wanted to major in when she went to college.... She had the look of determination.